The Proxxon Longneck Angle Grinder LHW/E is light, compact, and user-friendly. Useful for grinding, deburring, roughing, and finishing. It is also great for paint and rust removal, cutting small components and sharpening tools. The Bosch GWS18V-45-01 18V 4-1/2 inch Angle Grinder Kit features a tool that's an ideal portable cordless grinder for professionals who need reliable power. With its four-brush motor design and optimized gear structure, the tool is engineered for all-day tasks. The kit includes two 18V 4.0 Ah FatPack batteries with outstanding runtime and an 18V fast charger. The BC1880 18V fast charger can charge a 4.0 Ah battery to 80% in 25 minutes and to 100% in 35 minutes. The grinder is powerful, producing 10,000 no-load rpm, to handle professional cutting and grinding applications. It features a two-position Vibration Control side handle for better handling and less operator fatigue. It is designed for long tool life, with Bosch's Electronic Cell Protection and Electronic Motor Protection, as well as optimized brush design. For user protection, this cordless grinder was engineered with a quick-change, burst-resistant wheel guard and restart protection to avoid accidental startup. The Bosch GWS13-50P 5-In. Angle Grinder with Paddle Switch furnishes an easy-to-operate multi-grip paddle switch for user control and comfort, while delivering 13 amps and 11,500 RPM of professional power. The grinder has constant electronics for easy starts, level operation and dependable speed under load. For longer life, it was designed with directed air flow, diverting dust away from vital components, and it has also direct-motor cooling, giving it higher overload capabilities. It is equipped with a two-position Vibration Control side handle, making it less strenuous to operate. For safety, it features an integrated acceleration sensor to limit inadvertent recoil and restart protection to protect against unintended startup. It has a burst-protection quick toolless adjustable guard and a large spindle lock for a more convenient disc change. The Service Minder brushes stop the grinder when preventative maintenance is required. The DEWALT DWE4517 features a high power 4 HP (maximum motor HP) 8,500 rpm motor with overload protection that provides higher operating speeds under load. An epoxy coated field and armature provide long service life against abrasion from airborne debris. Backed by a DEWALT 3 Year Limited Warranty for added peace of mind. The DeWalt DWE4559N features a high power 4.7 hp (maximum motor hp) 6,500 RPM motor provides overload protection for higher operating speeds under load. DeWalt's Dust Ejection System increases brush life and protects the motor from damaging particles entering the air intake that would otherwise abrade the motor. Backed by a DeWalt 3 Year Limited Warranty for added peace of mind. Long Neck Angle Grinder LHW/E with Storage Case The Proxxon Longneck Angle Grinder LHW/E is light, compact, and user-friendly. Useful for grinding, deburring, roughing, and finishing. It is also great for paint and rust removal, cutting small components and sharpening tools. 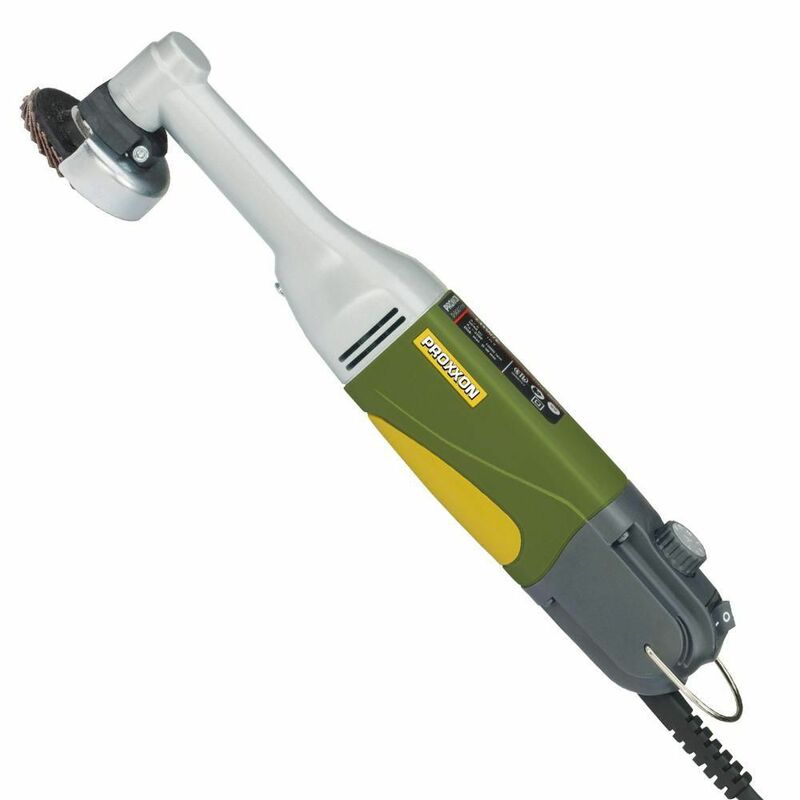 Long Neck Angle Grinder LHW/E with Storage Case is rated 3.7 out of 5 by 3. Rated 5 out of 5 by Douglas from Good.... Good. Rated 5 out of 5 by cookie67 from Perfect tool to work with. Bought this grinder last 9 th and I am so pleased with it. Works great. Rated 1 out of 5 by Kstjohn from Not worth the money Started smoking after second use on a soft wood! Bought a pneumatic small wheel grinder.